By ordinary game standards, it would feel a bit one-paced, but judged by the criteria which must be put in place for VR games, it's a winner – it's great fun, and transports you most convincingly to a different, Tron-like world. So PlayStation VR has arrived, offering a cheaper-than-PC means of experiencing the joys of virtual reality on PlayStation 4. But like every new item of gaming hardware, it's in dire need of a so-called killer app: a game which is an abdolute must-play. 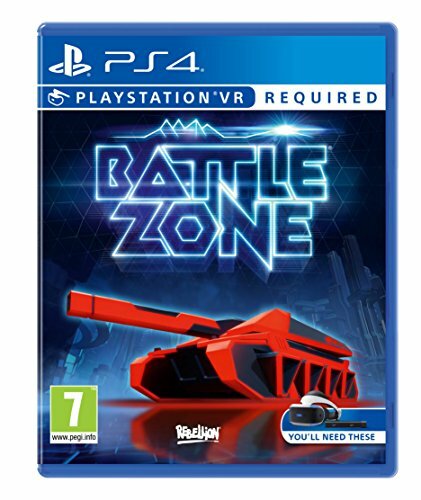 Battlezone doesn't quite fit that bill, but it's a cleverly designed effort which, crucially, feels fully realised - whereas many first-wave VR games resemble extended demos - and should definitely be on your shopping list if you do succumb to PlayStation VR's charms. The nature of virtual reality demands slightly different reviewing criteria to non-VR games: for example, developers haven't yet worked out how to add narrative to VR games in a satisfying manner (stories presented in conventional voiceover seem restrictive in an immersive world). So if you were to compare Battlezone to a normal game, you would say that its campaign is light on ebb and flow. But it easily makes up for that by taking advantage of many of VR's unique possibilities. On paper, you could also argue that it's an odd candidate for what is being presented as the cutting edge of modern gaming, since it's a labour of retro-love. That's because it's a reinvention of the 1980 Atari arcade tank-warfare classic – for which canny Oxford developer Rebellion obtained the intellectual property rights in 2013. But with its (then-innovative) first-person viewpoint and vector graphics, along with the viewing goggles built into the earliest version of its arcade cabinet, in hindsight, the original Battlezone eerily prefigured virtual reality. And Rebellion's 2016 reinvention more or less proves that point. When you first get it going, before jumping into any action, it instantly provides that sense of presence which is the raison d'etre of good VR. You find yourself in a voluminous and very convincing tank cockpit which is both high-tech and appropriately retro – virtual screens with green text, for example, reference the arcade original's green-on-black colour-scheme. A brief tutorial introduces the basics – Battlezone uses a standard PS4 gamepad as its controller, and shows you a virtual version of that controller in-game if you look down, in order to avoid disorientating disconnections. The controls are pretty intuitive – switching between weapons proves to be a key mechanic, since the more powerful weapons take an age to reload, as they would in any tank. The tutorial demonstrates that the tanks – actually hover-tanks, given the futuristic setting – are surprisingly fast and manoeuvrable. The landscape through which you battle will also induce waves of 1980s nostalgia, as they look like they could have been ripped straight out of Tron, with plasticky textures galore, copious neon and primary colours to the fore. This style keeps things looking smooth, avoiding any nausea. When you jump into the game proper, there are a couple of decisions to make, since each session is procedurally generated. First, you must choose whether to play offline or online – the two games are structurally the same except online you can play co-operatively with up to three others, and difficulty levels are cranked up accordingly. Next, you must choose your tank – light, medium and heavy ones have different weapon load-outs and trade armour off against manoeuvrability. Then you decide on the length of the campaign you want to play (to conform with good VR practice, each campaign is delivered in bite-sized chunks), and that campaign is generated. The campaign is visually represented as if it were a board game, resembling an arena formed from hexagonal tiles, and the idea is to get from one side of it to the other. It's a good idea to plot a course towards the control towers dotted around the board – taking control of those can swing the battle your way, as the enemy faction grows in strength with every battle, and sends Nemesis boss-tanks to seek you out. In the spirit of the arcade original, Battlezone is pretty hard and unforgiving. You start with three lives and once your lives have been used up, that's the end of the campaign. You can buy lives using data, which enemy tanks, towers and bases drop when you destroy them, but they are pretty expensive, and the same currency is used to upgrade your tank, which can be performed to a fine degree (for example by reinforcing rear or front armour). Before venturing onto a new hexagon, you can drop a probe to see what is in store, but it's much more fun to approach a battle blind. Occasionally, you may encounter no resistance, and some hexagons merely bring supplies, allowing you to purchase new weapons or change your loadout. But usually, you are assigned a task, which might be protecting a convoy from enemy attack, taking down an enemy base (while making sure yours remains intact) or taking out an enemy convoy. While the game's AI isn't enormously fierce – enemy tanks take a while to lock onto you, although you have to take care not to expose yourself to missile-firing towers – the difficulty derives from how plentiful the enemies are, and you have to pay attention to the amount of damage you're taking. Battlezone is sufficiently hard that, for once in a game, it's worth selecting Easy mode while you're learning the ropes. Picking the right tank is mostly a matter of deciding which of its weapons you prefer – Rebellion has put some thought into the standard loadouts. For example, a medium tank comes with a gun that can lock onto multiple targets, as long as you have them in line of sight, which is very handy, but locking on takes a while, as does reloading, so you will come across occasions in which it's necessary to switch to the tank's conventional rocket, which must be aimed carefully. Thus, as you find yourself in different situations, you evolve weapons-based strategies. Battlezone is pretty simple - both in terms of structure and gameplay - but, just like the arcade original and its contemporary games, you soon discover that there is depth to its gameplay, and the element of procedural generation provides plenty of reasons for you to return to it. On its own, it might not persuade you to take the plunge and lash out on a PlayStation VR. But if you have bought a PS VR, make sure you grab a copy.